Freshen up your home with these floral designs! 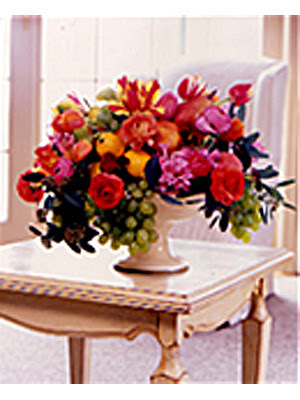 Forget taking a trip to a florist for a fabulous arrangement. You only need to go as far as your local grocery store. Simply walk down the produce aisle, fill your basket with vegetables, fruits and flowers, and you have the makings of a stunning centerpiece. Then follow our step-by-step instructions for creating unique, eye-catching floral designs. And we promise you'll save a lot more than if you visited a flower shop! 1. Place two strong rubber bands around the center of the can and insert the asparagus stalks inside the bands. 2. Use raffia to cover the rubber bands. 3. Fill three-quarters of your can with water and place the long stems of the pansies around the edges so they meet with the asparagus tips. 4. Fill the center of the can with the hyacinth. 1. 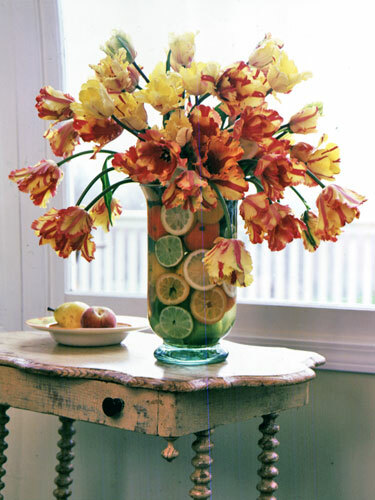 Fill your vase about three-quarters to the top with the whole oranges, lemons and limes. Reserve two different pieces of fruit. 2. Slice the reserved pieces of fruit and slide them down into the inside edge of the glass. To push fruit slices to the bottom, use the handle of a wooden spoon. 3. Fill the vase to the top with water. 1. Place the Styrofoam blocks into the container to form a rectangular shape. Push a few wooden skewers through the Styrofoam to connect the blocks together. 2. Using a kitchen knife, cut the Styrofoam into a cone shape. Make the cone smaller than you want the completed arrangement to look because once you add the lemons, it will be larger. Cut a flat top on the cone about 2 inches from the original top. 3. Place the Styrofoam back in the container and use a skewer horizontally to secure the cone to the base. 4. 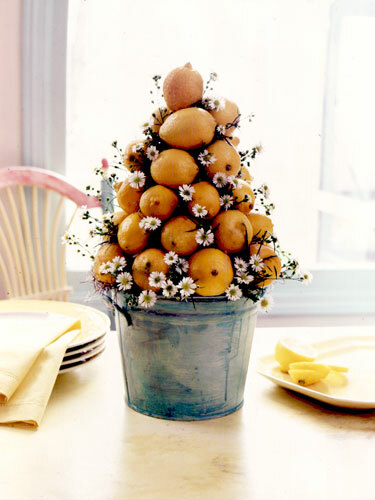 Starting at the bottom, attach the lemons to the cone using floral pins. The pins should be hidden at the back of the lemons. 5. When all the lemons are attached, cut small stems of tiny flower heads and push them between the lemons to hide any gaps. 1. Soak your floral oasis in a bowl of water overnight. 2. Place the floral oasis in your chosen container. 3. Wire or push the floral sticks into the base of the mini-artichokes, broccoli, asparagus, endives and kale, using the longer floral sticks for the vegetables that will be placed in the center of the container. 4. Push the vegetables randomly into the oasis. 5. 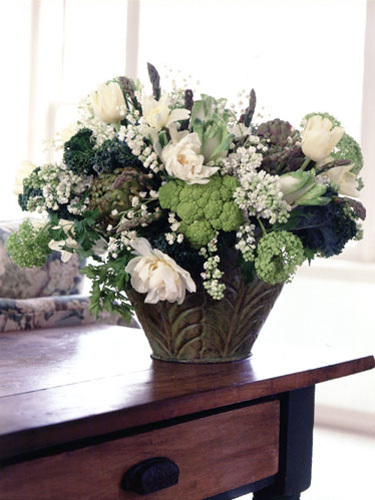 Push the stems of the flowers between the vegetables in the oasis. 1. Soak the floral oasis in a bowl of water overnight. 2. Place the floral oasis in the footed dish. 3. Wire or push the floral sticks into the base of the nectarines, peaches, pears and lemons. 4. Wire the floral sticks to the bunches of grapes. 5. Insert the sticks with the nectarines, peaches, pears and lemons into the floral oasis, placing them randomly around the bowl. 6. Attach the floral sticks with the grapes to the oasis so they hang over the edge of the bowl. 7. 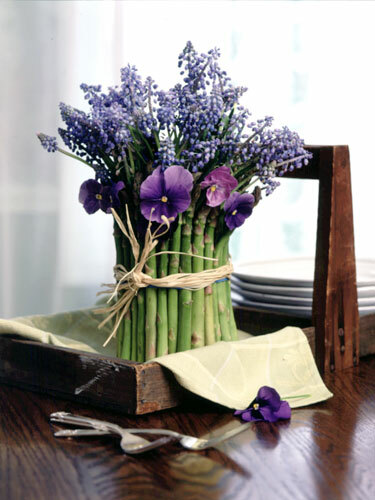 Cut the stems of the flowers and push them into the oasis between the fruits (no floral picks should be needed). 8. Add eucalyptus or greens to fill any gaps.